NEO is proud to uplift the our grantees and the voices behind them. In this feature, you’ll read about Jonathan Jayes-Green. Jonathan is the co-founder and director of UndocuBlack Network, a grantee of NEO’s Four Freedoms Fund. Some people dream of what they are going to be when the “grow up” and find their way into that profession. Others are called. 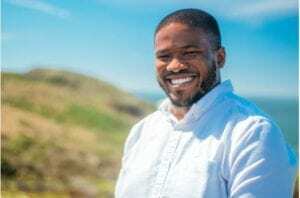 Jonathan Jayes-Green, co-founder and director of UndocuBlack Network, is one of the called ones. Jonathan’s calling began in high school when he worked on an election campaign. His activism set in when he realized he was undocumented and felt called to do something for his community. He needed a place to heal, a place to talk to people going through similar experiences and share resources. When he realized that space didn’t exist, he created it. Jonathan’s creation – the UndocuBlack Network – is a multigenerational network of currently and formerly undocumented Black people that fosters community, facilitates access to resources and contributes to transforming the realities of Black people so that they are thriving and living their fullest lives. Through UndocuBlack Network, Jonathan is working to create a world where Black people of all backgrounds – queer, disabled, undocumented – can move around the world feeling safe, free and have endless opportunities. If the organization sounds strangely familiar, it’s probably because they were just at the center of the widely reported immigration case of rapper 21 Savage. When ICE detained the popular artist, UndocuBlack sprang into action and created a petition for his freedom that received half a million signatures online. Although this particular case garnered a lot of buzz, it wouldn’t be Jonathan’s proudest moment. He’s proud of the moments that aren’t getting much attention. The cases where he’s able to get an asylum seeker fleeing persecution for being queer released after 900 days in detainment. Those cases make him keep moving forward. Jonathan isn’t just sitting back and hoping that his vision for the world will one day come true. He’s putting in the mental, physical and emotional labor to see it through. He’s working with other organizations to build multi-racial/multi-ethnic coalitions. Each day he’s surprised by the number of folks that show up with the same vision with a heart filled with gratitude ready to put in the work. His existence as an undocumented Black person is proof alone to the communities he serves of what they can be. For more information about the UndocuBlack Network, or to get involved visit http://undocublack.org/.